Submitted by Onimoz on June 14, 2010 - 12:32am. eyeless and handless XD ROFL. Submitted by Xelmon on June 14, 2010 - 12:43am. As for the "this is how my retina fell off", are you humoring us, or are you talking about keratoconus? I only know of it's existense because my sister has to deal it with via sclaral RGP lenses. If you think it's though with glasses, you haven't had the bad luck with KC. Submitted by alborticus on June 14, 2010 - 5:41pm. I worked in an optical store for a few years in university. I'm guessing the reference is to retinal detachment, in which your retina literally detaches from the underlying tissue or some such. We had exactly one case come through the store, luckily on a day when our optometrist was in and free for walk-in appointments. There was a (very) brief moment of panic in her expression as she immediately called for one of us to drive the patient directly to the emergency room as she simultaneously called ahead for an opthamologist to meet us there. Apparently the patient was dangerously close to being blind forever. Scary stuff. Submitted by LeSwordfish on June 14, 2010 - 2:08am. I've just been told i have the exact same thing. Took me by surprise too. Submitted by Jay on June 14, 2010 - 2:19am. I remember when I had mild astigmatism. Now it's like 500 degrees or something stupid like that. Submitted by Serbian Goth on June 14, 2010 - 4:56am. Submitted by Jam on June 14, 2010 - 8:30pm. Submitted by r21187 on June 15, 2010 - 7:53pm. Submitted by Rosscott on June 14, 2010 - 5:22am. That's about how I feel all the time. I used to be the opposite and never get anything checked out, until my roommate had some pretty absurd things happen to his toe. Now I'm constantly sure the world will kill me. Submitted by frankwolftown on June 14, 2010 - 8:39am. Submitted by slick kat on June 14, 2010 - 10:13am. on the other end of the spectrum, i thought my eyes were perfect until i got my every-8-yearly checkup and was told i had an astigmatism. got me some glasses and found out that yes, my vision was in fact slightly screwy. i'd never have been able to tell without having used the glasses. Submitted by RheaRain on June 14, 2010 - 11:37am. Submitted by DarkRaziel on June 14, 2010 - 12:34pm. I really loved the expression on the final panel xD so much relief in there. Submitted by Branchlaw on June 14, 2010 - 4:00pm. Submitted by General Specific on June 14, 2010 - 5:58pm. The eye balls popped out & in the jar are bit unsettling. Submitted by greg on June 14, 2010 - 8:09pm. 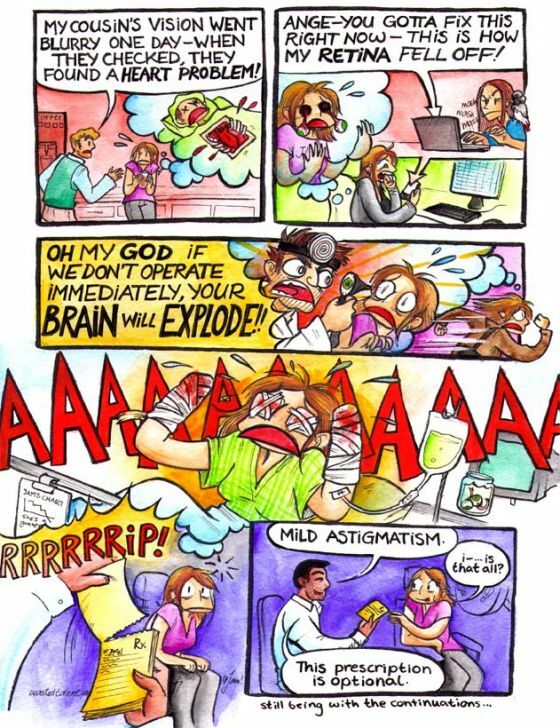 This is my thought process with any medical condition. Submitted by Jam on June 14, 2010 - 8:31pm. I convinced myself that I was going deaf today. Submitted by greg on June 15, 2010 - 11:40am. Well, obviously, then your feet are going to fall off. Submitted by Ealanari on June 15, 2010 - 12:56am. Welcome to the world of having rugby-shaped eyeballs! I have to admit that I follow similar thought processes whenever I notice anything "wrong". Submitted by sakuraruby on June 15, 2010 - 6:41am. Ahahaha...My eyes have been football shaped all my life...almost went blind when I was a baby. I've always worn glasses. I think They're nice. Submitted by BeamStalk on June 15, 2010 - 8:29am. I like the eyes sitting in a jar next your bed. I wear contacts, started with glasses in Junior High. Submitted by Dax on June 15, 2010 - 9:21am. May I weirdly suggest *eye yoga* ? Submitted by Jam on June 15, 2010 - 11:36am. You may! Is this stretching your eyes by looking at a distance? Submitted by Dax on June 16, 2010 - 9:50am. Submitted by Jam on June 16, 2010 - 1:12pm. Submitted by omniwarrior on June 15, 2010 - 11:42am. A few years back my eyesight started bothering me. I was driving along and I could not read the signs as far off as I normally did. I had it checked out and they said that my right eye had that. Right was 20/25, the left was 20/20. I used to be able to see 20/15. It suxx getting older. I would say that if I was guaranteed 20/10 or better, I would go with lasik. Submitted by Reyco on June 16, 2010 - 5:21am. I'm pretty fresh out of school, been working in the engineering field for about a year now. I started getting headaches from squinting at the monitors all day and I gotta say, getting larger monitors really does help. I have dual 24" monitors that are about 2' away from my face, But 55", that's ginormous! I know high school kids that wouldn't fit diagonally across that. How far away from that thing are you? Submitted by sakuraruby on June 16, 2010 - 9:12am. Submitted by omniwarrior on June 17, 2010 - 11:45am. Anywhere from 5 feet to 12 depending on what I am doing. Submitted by Pimp Chickens on June 17, 2010 - 11:35pm. Anyone else get a sudden urge to dramatically yell the words in the third panel? It's optional as in I only need it when I'm working on spreadsheets or comics-OHWAIT that is all the time.